Starting a new series of posts, inspired by the work horse group’s website’s horse of the month-posts. Click the link above for more photos! First up is gelding Jalo-Jussi, a Helsinki city worker, owned by Lauri Karjalainen. Born 26th of March 2001, owned by Lauri since December 2006. After having two not-so-nice-tempered mares in his stable, Lauri was already going to leave the horses. Yet he was convinced to take the gelding Jalo-Jussi for a two-week trial. This horse was the first that stood still while asked, which made him a keeper in Lauri’s stable. Earlier the horse had worked in endurance riding. Lauri and Jussi work in Helsinki city parks, such as a fortress from the world war I with its trenches. They are also highly expected visitors at the local day care centers. Just like a work horse should be, Jalo-Jussi is calm and patient. Lauri tells he has also a sharp pull if necessary, but he won’t break the harness. Sometimes their load has fallen down but the horse stays calm. He goes well where the machines can’t, specializing in shore willow scything and other challenging environments. 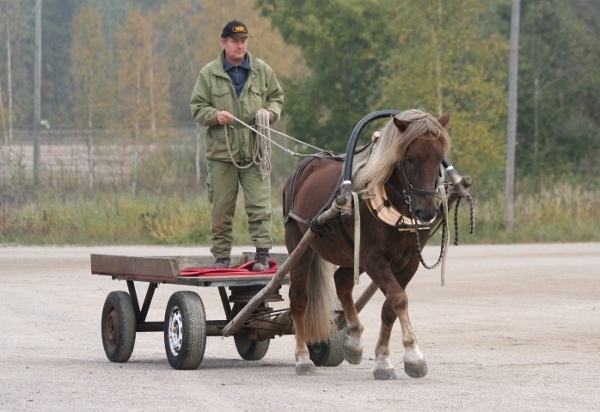 Categories: Work horse | Tags: Draft horse, finnhorse, suomenhevonen, työhevosharrastajat, work horse | Permalink.